HV AD4 ECAT MiniModules convince with their compact design and are ideally suited for use in the field of e-mobility, e. g. in engine compartments and on test benches. 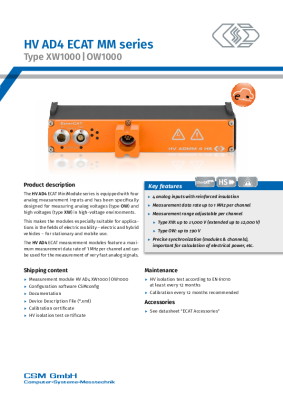 Thanks to a measurement data rate of 1 MHz per channel, even very fast analog signals can be recorded very precisely. Quick and easy module configuration is done via CSM’s free configuration tool CSMconfig. 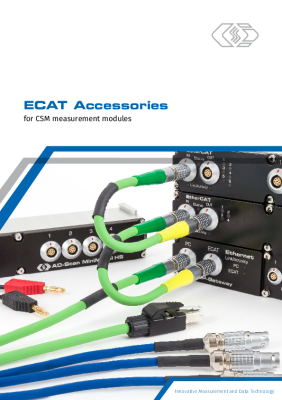 The module is either operated at a CSM XCP-Gateway (measurement data acquisition via XCP-on-Ethernet) or it can be connected directly to a standard EtherCAT® master (max. 10 kHz/channel). 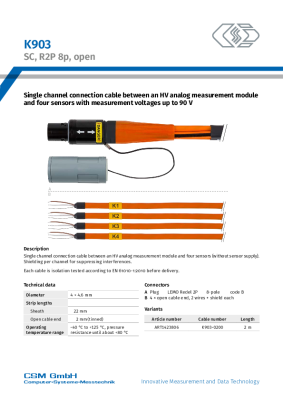 precise synchronization (modules & channels), a key criterion for power calculation etc.